President-elect Donald Trump plans to create a National Trade Council within the White House, to be run by economist Peter Navarro of the University of California at Irvine. The elevation of trade policy to the same heights as the National Security Council in the White House hierarchy appears to demonstrate Trump’s seriousness about focusing on an overhaul of the systems under which goods flow into and out of the U.S.
Further, the NTC will “advise the president on innovative strategies in trade negotiations, coordinate with other agencies to assess U.S. manufacturing capabilities and the defense industrial base, and help match unemployed American workers with new opportunities in the skilled manufacturing sector.” It will also oversee Trump’s promised effort to focus federal procurement dollars on U.S. companies. The nomination of Navarro to oversee that effort is likely to cause a lot of heartburn among conservative economists. While his qualifications, including a Harvard Ph.D., are impeccable, Navarro is definitely an outlier among his fellow economists when it comes to the impact trade policy has on the economy. Like Trump, he appears to relish confrontation on trade issues, which will raise concerns about the possibility of damaging trade wars during a Trump administration. Particularly on the question of trade policy with respect to China, Navarro is a hawk’s hawk. 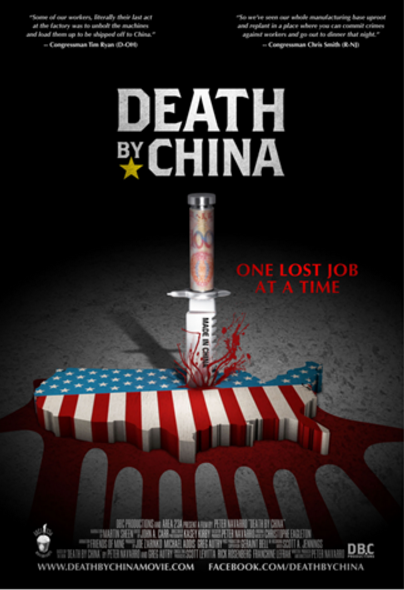 His 2011 book, Death by China: One Job at a Time, was turned into a documentary film. A lurid poster advertising the film showed a knife inscribed “Made in China” plunged into a flag-draped United States of America with blood pouring out of it. In September, Navarro and private equity investor Wilbur Ross, Trump’s pick for commerce secretary, released a white paper defending the candidate’s economic proposals. At the heart of their argument was the assurance that Trump’s plans for a massive tax cut wouldn’t harm the federal budget because of offsetting gains from his trade policy. In their analysis, they argued that the gains from trade could be expected to add $1.74 trillion in additional tax revenue to the U.S. Treasury over the space of 10 years. Economists -- particularly conservative economists with a free trade bent -- were incredulous. Many economists were troubled by the paper’s apparent assertion that simply by exporting more and importing less, the U.S. GDP would grow dramatically. Experts said that prediction flies in the face of basic economic theory about what contributes to GDP growth. The paper also advocated a far more confrontational approach to dealing with international partners such as the World Trade Organization, threatening to pull out of the organization entirely unless U.S. goods receive more favorable treatment. Again, trade economists were stunned at this proposal, which one described as “playing chicken with the WTO.” They argued that the idea that the U.S. could strong-arm the WTO -- a body where all decisions must be unanimous -- is fanciful. But it’s precisely the willingness to ignore conventional thinking about trade policy that makes Navarro so attractive to Trump. A statement attributed directly to Trump said, “I read one of Peter’s books on America’s trade problems years ago and was impressed by the clarity of his arguments and thoroughness of his research. He has presciently documented the harms inflicted by globalism on American workers, and laid out a path forward to restore our middle class. He will fulfill an essential role in my administration as a trade advisor." Donald Trump has chosen the wealthiest cabinet in American history. Here’s how much the nominees are worth.